Dr. John Eric Goff and Chad Hobson ’17 are continuing their annual tradition of using physics to make predictions about the Tour de France. This week, they are presenting their research on the topic at an international sports physics conference in the Netherlands. 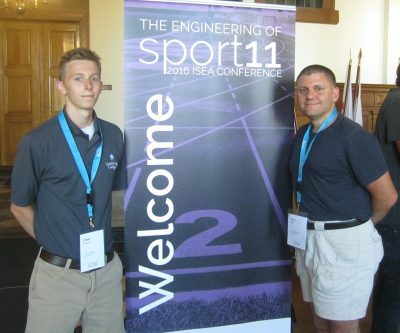 The Engineering of Sport, the annual conference of the International Sports Engineering Association, started in Delft, Netherlands, on Monday. During the conference, Chad, a Westover Honors student, will present a paper he authored about the Tour de France research he has conducted with Dr. Goff, who will present a paper about their research on the physics of the Brazuca soccer ball. For more than a decade, Dr. Goff and his students have used the laws of physics to model the Tour de France. Using data about cyclist power and the race’s elevation profile, they try to predict the winning time for each stage. Often their predictions come incredibly close, such as when they predicted seven stages within 1 percent of the actual finish time. Sometimes, however, unpredictable cyclist strategy and weather cause unexpected changes in finish times.